This shader is a glorified texture panner, with a few extra features oriented towards adding variety. By getting creative with mesh geometry and textures, we can achieve a wide range of results. It can be edited through Amplify Shader Editor and contributions to the project are always welcome! You can also just download a unitypackage (lightweight) from the releases tab and easily import everything to your project. This will not download the screenshots folder. When using textures that allow transparency (.png for instance), this information is taken into consideration. A series of meshes ready to use are included within this repository, but depending on your project, you will most likely have the need to use meshes other than these. In this case, we need to be mindful of the UVs. Furthermore, we can see both side faces are going against each other, thus breaking the scrolling effect. We need to lay out the UVs of our mesh in a way that allows for easy scrolling. For instance, if our goal is to make the arrows loop through the side faces of the cube, we need to get rid of the top and bottom faces, and orient all the side faces in the same direction. This shader is comprised of a few “modules”, that work independently and can be activated/deactivated without affecting each other. Original: The original color of the texture is respected, no action is taken. Hueshift: The hue value of the texture is shifted by the hue value of the selected color. Multiply: Direct multiplication of both colors. Replace: Gives a new color to the whole texture. This allows you to pulse the Emission value of the color, by specifying an amplitude and a frequency. By tweaking the offset value we can also make it fade into transparency. This module is the core of this shader. It allows you to scroll the texture in both axes, with independent speed values. As an alternative, it is also possible to rotate the texture instead of scrolling it. In this case, it is advised to set the texture’s wrap mode to Clamp instead of Repeat, otherwise, copies of the texture will sometimes bleed in through corners. It is also possible to disable both of these modes. This is useful in case we just want some scanlines scrolling through a static texture. Allows you to simulate transparent scanlines looping through the texture. By ticking/unticking the Sharp option, we can get a slightly different look. By manipulating the vertices of the mesh we can make it stretch along the horizontal and the vertical axes. 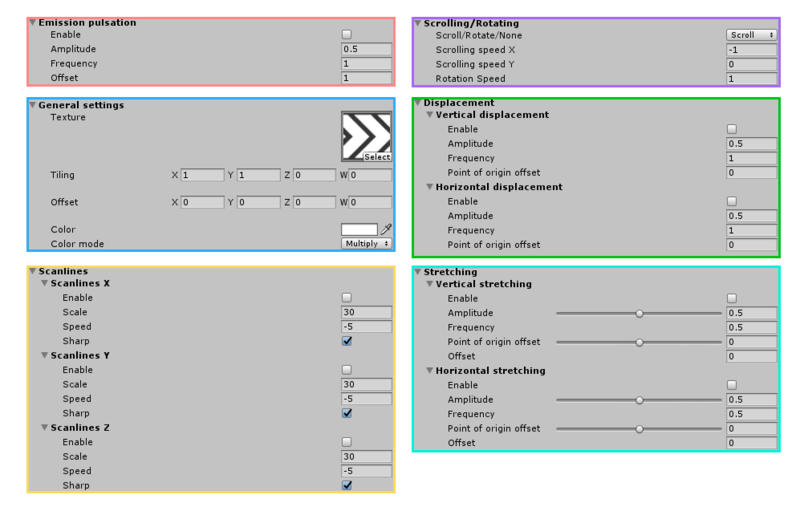 Amplitude offset comes in handy if you don’t want the texture to ever reach a value of 0, and the Origin offset parameter allows you to offset the anchor point for the stretching. Very similar to the previous concept, it allows for a displacement of the whole mesh. Texture masking gives you another level of customization, when active (there is a texture selected), we can use the main texture as a “fill” for this new masking texture, which will act as fake geomtry. This way, we can easily fake geometries with textures, and use the main texture as a pattern. This is an alternative way to use this shader. 3D space loading rings are a great application for scrolling textures, since you can easily create unique-looking pieces. Conveyor belts are the prime example for texture scrolling, since they illustrate the concept perfectly. A slightly different version of the shader (TexturePanner_opaque) is used for these ones, which can cast and receive shadows. Texture panning is a simple concept that we can take advantage of to create a huge variety of effects. We are just simply scrolling said texture over a mesh, but the results we can achieve are really diverse. By stretching the mesh and scrolling the texture at high speeds, we get a twitchy behaviour, resembling the appearance of spaceship thrusters. Given the appropriate mesh and UV setup, this shader can be used to achieve that futuristic cyberpunk neon ad look, including scanlines. Also, A E S T H E T I C.
Experiment with new geometries and effect combinations. Sometimes the most fun outcomes are the result of just toying around!